The second of three planned Oporto restaurants has opened in Ontario. The Australian-based chicken burger chain opened its first U.S. restaurant in Rancho Cucamonga back in February, with plans to open in Ontario and Glendora. The Ontario location, a former Fazoli’s, incorporates a drive-through, which the Rancho Cucamonga location lacks. The restaurant opened Saturday (June 16). The Glendora location is expected to open by the end of September. The Ontario Oporto is at 4295 Concours St. I recently got an email from reader Sarah, a self-described “ice cream fanatic,” who noticed that the Rancho Cucamonga Marble Slab Creamery had closed. It appears to have been the last one in the Inland Empire. At one time, the Cold Stone Creamery competitor had locations in Fontana and Chino Hills, in addition to the one in Rancho Cucamonga, but no more. The closest location is Woodland Hills. It’s been tough keeping this one a secret. We’re glad we’re able to finally share it with you. Due to the overwhelming success of the inaugural Inland Empire Food Truck Fest last month, the organizers have quickly planned a second event. Billed as the Inland Empire Food Truck and Brew Fest, the event will take place from 11 a.m. to 6 p.m. October 8 at the Citizens Business Bank Arena in Ontario. As the name suggests, the event will also incorporate the flavors of local breweries in addition to the gourmet food trucks. Also new to the mix is hockey demonstrations from the Ontario Reign and the Los Angeles Kings. Ticket prices remain the same: A limited number of V.I.P. tickets will be available for $25, which will grant you early entrance and other goodies. General admission tickets will be $8 in advance, $10 at the door and in the few days preceding the event. Tickets will go on sale at 10 a.m. August 13, so save your pennies. Tickets will again be available via Ticketmaster, or if you want to avoid those ridiculous “convenience” fees, at the Citizens Business Bank Arena box office. For more information, visit the event’s website here, or follow on Twitter or Facebook. I wish I had some free guacamole and chips…oh, wait! That’s the latest coupon giveaway from Baker’s Drive-Thru! As in the past, the deal is good today only, one coupon per person or per car, per visit. Not valid with other offers, etc. You can also show the coupon on your phone to get the deal. Head to the Facebook event page to get the coupon. For those of you who missed the Inland Empire Food Truck Fest, or if you’re just ready for round two, the Riverside Food Truck Festival has been announced for Saturday, September 3. The festival is set for 11 a.m. to 4 p.m. at Third and Market streets in downtown Riverside. A limited number (300) of V.I.P. tickets will available for $25, which will include early entry (10 a.m.), access to an air-conditioned V.I.P. tent, goodie bags and a private patio. The Riverside Food Truck Fest will also be fundraiser for three Riverside-based charities: Riverside Arts Council, Asian Pacific Lunar Festival and Riverside County Prevent Child Abuse. We’ll have more information as it appears. Panda Express, which periodically issues coupons good for free entres, is at it again. However, this time you’ll need to make a purchase to get an order of Garlic Lovers Chicken Breast. The offer is good today (July 13) only. Click here for the coupon. Panda Express restaurants can be found throughout the Inland Empire. 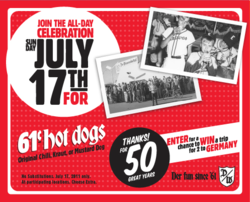 Wienerschnitzel, which has been celebrating its 50th anniversary with deals and contests for quite some time now, is offering a deal this Sunday (July 17) — the company’s official birthday — that is guaranteed to make hot dog lovers smile. For that special day, Wienerschnitzel will lower the price of its original chili, mustard and kraut dogs to only 61. Why 61? Because the restaurant started by John Galardi as a single drive-through in Wilmington back in 1961. In addition, you’ll be able to enter to win a 7-day, 6-night trip for two to Germany, plus $1,000 cash. Entry forms will be available only on Sunday. Rancho Cucamonga’s Suite 106 Cupcakery, which won the first time it was on Food Network’s Cupcake Wars, has returned to the show for another challenge. The episode will air at 8 p.m. tonight. The bakers were challenged to create cupcakes for the Tony awards in New York and incorporate caviar, escargot and foie gras in the desserts. The bakery is also readying its food truck which will roam outside the Inland Empire (where food trucks are currently banned from operating on a daily basis), bringing more unique flavors than found in their Victoria Gardens shop. One flavor they are planning to bring is a nacho cupcake, a four-cheese buttermilk biscuit with jalapenos and bacon, topped with sour cream, chives, more cheese and more bacon. No word on escargot, though. Suite 106 Cupcakery is at 12434 N. Mainstreet in Rancho Cucamonga. Click here to read Wendy Leung’s article on the bakery. Monday is July 11, aka 7/11, aka 7-Eleven Day! 7-Eleven Day happens to be the adopted birthday of the ubiquitous convenience store, and it celebrates with deals, including free 7.-11 ounce Slurpees. One particular store will be celebrating Saturday and Monday. For more information, and a reminder to stop by for your free Slurpee, head to the 7-Eleven Day Facebook event page here.